The most humbling picture. The NASA spacecraft Juno, took a snap shot as it was leaving Earth behind on it’s way to study Jupiter. That is Earth on the left and our Moon on the right. Would you ever guess life existed on that little dot? Personally I wouldn’t. It doesn’t look like anything too interesting to me. 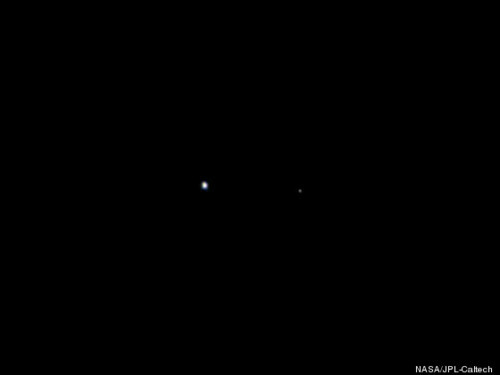 If I were on another planet looking through my telescope, Earth just looks like another moon orbiting another giant mass (the Sun). Life could be hidden anywhere in the Universe! Read a little more about the Juno space craft here.